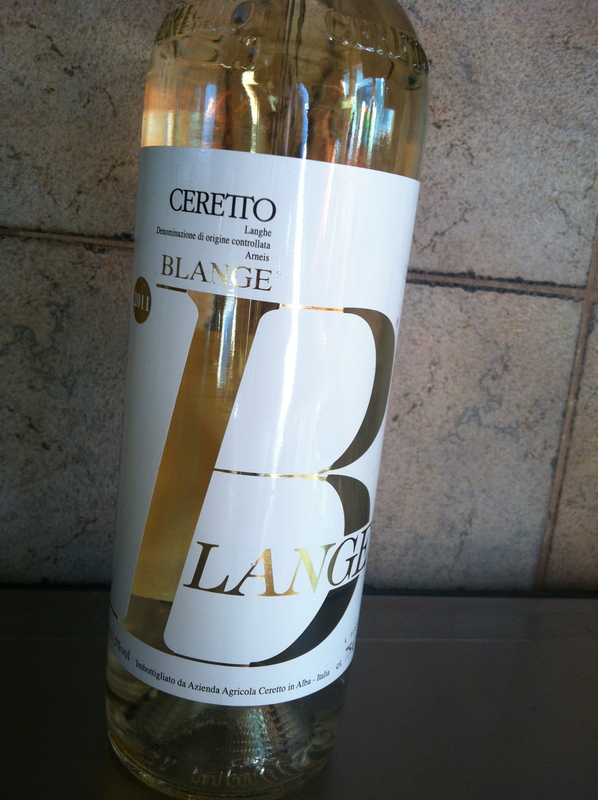 This week, my review is on Ceretto’s Blange’ 2011 vintage. This is an obscure wine made from an even more obscure grape variety native to Italy called Arneis which means the ‘little rascal’ in local Piemonte dialect. It is a grape variety that is difficult to grow and was traditionally used as a blending partner to the gorgeous Nebbiolo grape in the making of Barolo wines. I have had this bottle in my cellar for about 4 months after someone had told me about it. I searched it out and only found it at the Park Royal Signature liquor store on the North Shore and it retails for $24.98 a bottle. This wine is a pretty soft, pale lemon colour with a tiny bit of effervescence. On the nose, it has a medium intensity with aromas of white flowers, apples, pears and a hint of lemon zest. Ceretto’s Blange is a dry wine with surprisingly low acidity. It has medium plus alcohol at 13% Abv. and it is medium+ in body. It was again medium on the scale of flavour intensity on the palate with flavours of red apple, green pear and a floral component along with an odd taste of almond and clay. What can I say about this wine? It is a bit of an odd duck for me. I did not love it at all and it does not go into my “Hell Yes” category – if anything I am suggesting it is an “If you are in the mood” contender. I like my white wines fresh and juicy with usually high acidity. The low acidity and the faint almond flavour really threw me off. I had no preconceived notion of what this may taste like and I felt a bit disappointed in its’ overall lack of complexity and almost sour and flat taste. It was not bad – not at all – it just was not one of my favourites. Not a GGG favourite – at $25 a bottle – I would rather find something I really enjoyed. If you are ‘In the mood’ for a taste adventure – be sure to pair this with some dense white fish or a pear based salad. I would rate this a 6 out of 10 grapes. As always – thank you SO MUCH for reading! If you have not signed up to receive my posts directly to your email – please do so! Your comments are truly helpful and I welcome suggestions of wines to try! Doesn’t sound like my cup of tea. Looking forward to the next one.